Follow the instructions below to add and/or change information for UNI Alert. 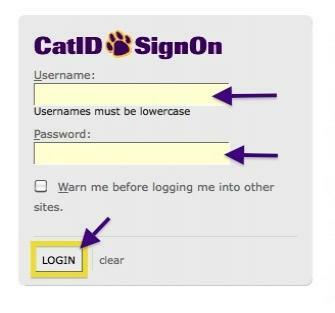 Log into MyUniverse using your CatID username and Password. On the "My Page" of MyUNIverse, under Emergency Preparedness, Click on Manage My UNI Alert Contacts. On the Personal Information page, Click on the tab that says, UNI ALERT. Under the UNI ALERT tab, you will find contact information that will receive alert information. Under Official Directory Data, you have a Local Phone and Home Phone: This information is provided by other tabs on Personal Information page. 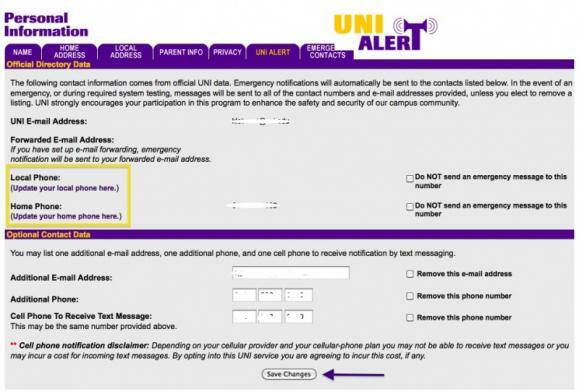 Under Optional Contact Data, you can provide information if you want another email or even cell phone to receive alerts from UNI. After making changes to your contact information, you will be directed to a page that wants the user to Confirm your Changes. This is done incase there is an accident or if something is not correct. If everything is correct, click the Save Changes button. Once you have confirmed your changes, you will be directed to confirmation page where you can make more changes to your Personal Information or Logout of MyUNIverse.